Retama Park will host 10 training races for 2-year-olds on Friday (Feb. 1) with first post set for noon (CST). SELMA, TX—JANUARY 31, 2019—Ten training races for Quarter Horse 2-year-olds, featuring several purchases from the summer yearlings in Texas, Louisiana, New Mexico and Oklahoma, will get underway at noon (CST) Friday (Feb. 1) at Retama Park. The South Texas racetrack will conduct the first of four currently scheduled 2019 training race days. All races on Friday will be contested over 250 yards. A pair of $20,000 LQHBA Yearling Sale graduates will face-off in Race 3. Trainer Jorge Barrera will saddled J F Racing & Farm LLC's Baby Freighttrain from post 4. Luis Franco has been tapped to ride the son of Grade 1 sire Freighttrain B from the grade 1-placed Carters Cartel mare Bay Ba Licious. The $25,000 colt is from the family of grade 3 winner Rock N Strawfly and grade 1-plaed Hierarchy . Perry High, a $20,000 LQHBA Sale graduate, will start from the 3 post in Race 3 for owner Pete Scarmardo. Leon Bard conditions the colt by second-crop sire Fire from the Mr Jess Perry mare A Jess Perry Chick. This is the family of Ruidoso Derby(G1) winner Jess Rapid and champion Cash Perks. In Race 5, trainer Jorge Barrera will saddle J F Racing & Farm LLC's Adored Runaway, a $40,000 LQHBA Yearling Sale graduate. The gray Sir Runaway Dash colt is out Adored Bigtime, by Bigtime Favorite, a half-sister to Retama Park Juvenile winner Adoring Jess. This the family of champion First To Flash and multiple stakes sire First To Shine. Tres Y Seis, a $25,000 Ruidoso Select Yearling graduate by leading sire Tres Seis, will start from the inside rail in Race 6 for owner Guerras Racing & L&G Racing. J. Muniz conditions the half-brother to grade 1 Dash For Cash Futurity winner Sixes Streak. The brown colt is out of grade 3 placed First Down Sixes by all-time leading sire First Down Dash. Jesus Muniz will also start the Captain Courage filly Gratisfyed for Guerras Racing Stable in Race 5. The $15,500 TQHA Sale graduate is a half-sister to three black-type including Dash For Cash Derby(G2) runner-up Sinuous and Remington Park Futurity(G1) third-place finisher Andorite. Gratisfyed is out of the Grade 1 winner and multiple stakes producer No Fees. KAP Racing Stables' Man On The Beach, a $17,000 LQHBA Yearling graduate by leading sire Heza Fast Dash, will start in post 3 in Race 8. S. Riojas, Jr. will saddle the bay colt out of Tahiti Evening, a Stoli full sister to All American Derby(G1) winner Dont Let Down. This is the family of numerous black type winners include Apollitical OK, Takianna Romanova B and Zoomin B Cartel to name only a few. CLICK HERE to download a list of Friday's entries, with sire, dam, owner, trainer, jockey and sale information where applicable. Results of the training races at Retama Park will be posted on StallioneSearch.com, when they become available late Friday. 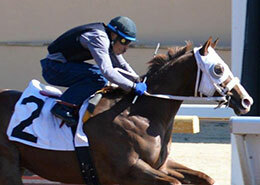 Additional training race days at Retama Park are scheduled for February 15, March 1 and March 15. The track has said it will add additional dates if necessary. Entries will close on Thursdays at noon prior to each Friday's training race day. Horsemen and women are asked to call 210-651-7043 for entries. The track will publish overnights at approximately 1 pm on the day of entries. The track will close at 11 am on training race days with the races scheduled for a noon (CDT) first post. Horses on the grounds will be required to pay a $45 fee with ship-in at $60. All fees must be paid prior to running. For additional information about training day rules and regulations CLICK HERE.